Jon Hill and Joe Oliver introduce the Acceptance and Commitment Coaching (ACC) model with clarity and accessibility, defining it as an approach that incorporates mindfulness and acceptance, focusing on committed, values-based actions to help coachees make meaningful changes to their lives. 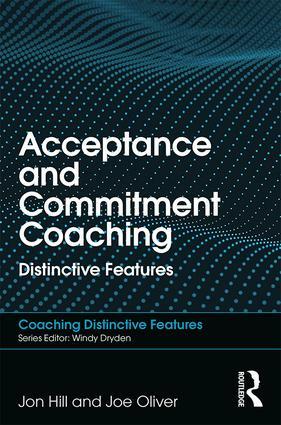 Acceptance and Commitment Coaching: Distinctive Features explains the ACC model in such a way that the reader will be able to put it into practice immediately, as well as offering sufficient context to anchor the practical tools in a clear theoretical framework. Split into two parts, the book begins by emphasising ACC’s relevance and its core philosophy before providing an overview of its key theoretical points and the research that supports it. The authors also explain the six key ACC processes: defusion, acceptance, contact with the present moment, self as context, values and committed action, and explain how to use them in practice. Hill and Oliver address essential topics, such as the critical work needed before and as you begin working with a coachee, how to use metaphor as an effective tool as a coach, and they finish by offering helpful tips on how to help coachees maintain their positive changes, how to make ACC accessible to all types of client, how to manage challenging coachees and how to work with both individuals and groups using ACC. Aimed specifically at coaches, the book offers context, examples, practicality and a unique combination of practical and theoretical points in a concise format. Acceptance and Commitment Coaching: Distinctive Features is essential reading for coaches, coaching psychologists and executive coaches in practice and in training. It would be of interest to academics and students of coaching psychology and coaching techniques, as well as Acceptance and Commitment Therapy (ACT) practitioners looking to move into coaching.